Lots of things bring tears to my eyes. The school that I student-taught at had a talent show; it made me cry three times. I feel sorry for my future children. Point being, children’s books also bring tears to my eyes. With giant pictures and so few words, that mean so much, picture books are something that my mother and I share a great love for. The first book which I gravitated towards was a neatly illustrated book entitled, Tundra Mouse: A Storyknife Tale by Megan McDonald. The book is a Christmas story that incorporates many aspects of Yup’ik culture including the language, local food and the use of a story knife. I carefully evaluated the book through the lens of the Multicultural Rubric. The characters of the book are highly developed and the illustrations are delightful. However, I could not help but question the authority and authenticity of both the characters and the setting. Author Megan McDonald is a non-native writer from Pennsylvania. It turns out she is quite a well known author; McDonald wrote a series that I loved as a child, the Judy Moody Series! What a strange connection. Although a talented author, McDonald holds no connection to the Yup’ik people. Also, the book’s theme, Christmas, brings religious overtones. I will only mention that my opinion on the use of religion in this context is not valid. Another book that caught my eye was, The Woman Who Married the Bear. I have a special relationship with this story. I have only hung out with my father’s mother, a Cree woman, a handful of times as she passed on when I was quite young. One of the times we went blueberry picking and she told me the story of the ‘woman who married a bear.’ The way my grandmother told it, in the beginning of the story a young women disrespected bear poo, instead of walking around it she kicked it. I spent my childhood, thinking that the ‘woman who married a bear’ was about not stepping in poo. Later in life I developed a more sophisticated grasp about the story revolving around tolerance, acceptance and a beauty-and-the-beast idea of valuing whats on the inside. When we are only looking for what is different in others we do not find that which we have in common. Throughout the year this notion has impacted my relationships with others in and out of the school. Due to my long standing connection with the story of the ‘woman who married a bear,’ and its abundance of Alaska Native values I would love to bring it into the music classroom. This specific version of The Woman Who Married the Bear, translated by Elizabeth James is stunning and powerful. The story is directly translated from elders of the Pacific Coast of BC, Canada. Furthermore, the theme and cultural values are highlighted in a way that would allow students to consider multiple perspectives. Finally, I am so happy that the story makes use of song. When the woman returns to her people she mourns the loss of her husband through song. She also uses song to teach her people about respecting the bears. What a great example of music healing and being used to pass down knowledge! One idea, that I had about using this book in the music room would be in songwriting. 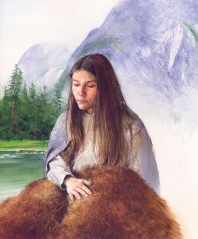 I would scaffold the experience so that by the time I read, The Woman Who Married the Bear to the class would have already gained background knowledge and experience with Alaska Native values. I would ensure that students understand song forms of many cultures on a local and worldwide scale. I would also try to collaborate with an elder or cultural bearer to introduce traditional instruments and their significance. Heidi- I’m interested by what you mean when you say your opinion on religion is not valid? Good question Devin! I guess I just wanted to express that the book is religious, specifically Christian, of nature. By saying that my opinion is not valid, I am just recognizing that as a person who is not Yup’ik, I am not going to make assumptions about the appropriateness of Christianity in a modern children’s story. Thanks for the personal stories. I like the approach to using picture books as material to help write songs. Giving students in music the ability to create new musical experiences is superbly important! You have a beautiful writing style with some of the most amazing transitions. Along with those, this was the best intro I have read today. It is alright to cry. It shows that you are human. In fact, as a writer, the goal is to impact the readers emotions and help them feel anger or sadness, grief or hope. So if you cry during children books, that is perfectly fine and in some cases natural. Beyond that, this is a great book and I hope you can find a way to put it into your future lesson plans. I don’t remember all of what happens, but it was read to me as a child. Thanks Mason! That means a lot to me. I try to put a lot of heart into my writing.